Tribeca 2012: Sports Docs Go for "Broke"
Americans have been enthralled for generations by sports. Boxing, horse racing, baseball, football, basketball… have had millions on the edge of their seat, in the grips of thrilling unscripted drama. But it wasn't until 1994, with the release of "Hoop Dreams," that the sports documentary really started to come into its own. Nearly 20 years later, they are a flourishing sub-genre, earning their own category at the Tribeca Film Festival. The mini TFF/ESPN Sports Film Festival features five films --"Benji", "Broke", "Knucklebal! ", "On the Mat", and "Town of Runners -- running the gamut from basketball to baseball to track to finances. Yes, finances. The story of the bankrupt athlete has become a staple of sports news, but "Broke," the new doc from Billy Corben, which is showing at Tribeca as a work in progress, is a long hard look at how it happens, from the guys who've been through it, as well as those who escaped. It wasn't easy getting everybody to sit and talk. "You can imagine, especially on camera, how people feel when you call them up and discuss this subject matter," concedes Corben. "I mean it really doesn't get anymore uncouth than that. It's like, 'Yeah, I want to talk to you about how much money you made. How much money you spent. How much money you don't have any more.' I mean I really give a lot of credit to the guys who did talk to us. 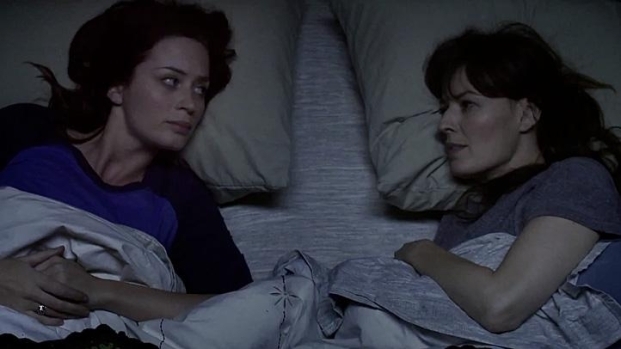 Emily Blunt, Rosemarie Dewitt and Mark Duplass star in this film about a woman whose sister and best friend have a one-night stand after a night of drinking away their sorrows. Written and directed by Lynn Shelton, opens June 15. Corben was drawn to the subject by an interview he did for an earlier film, 2009's "The U," about the infamous University of Miami football team of the early '80s. Bernie Kosar had been the quarterback for Miami's 1983 national championship squad, a good enough student that he graduated in just three years with a double major in finance and economics. Corben was so star struck at the time that it wasn't until the film aired on ESPN that it was pointed out to him how "punch drink," the quarterback appeared. Soon after, the story broke that Kosar, who'd made millions as a player and even more in retirement, was busted. Kosar graciously agreed to sit for Corben again, and in "Broke," he doesn’t look too good, either, his shirt, face and neck are disarmingly sweaty as he recounts how both his father and first wife both spent his money at a tidy clip, and how he one day realized he was paying the bills on some 60 cell phones, of which he only used one. Other ex-athletes, like Leon Searcy, Andre Risen, Keith McCants and Cliff Floyd, recount the different ways that the money can slip through your fingers, with stories of women getting email alerts as to athletes' whereabouts, family members and hangers-on with their hands outs, shady financial advisers, bad business deals, child support and unpaid loans. And of course there were the cars and jewelry and strippers. Emily hits the red carpet for the premiere of "The Five-Year Engagement" where she chats about how thrilled she is to open the 2012 Tribeca Film Festival, and why it was "tough" to act with co-stars Jason Segel and Chris Pratt. "I think conventional wisdom is that professional athletes spend a lot of money on stupid s***. And, spoiler alert, professional athletes spend a lot of money on stupid s***. That barely scratches -- but so do all Americans since the '90s, you know," says Corben, going on to note that many of these tragic tales played out at a time in the country that was ripe for such profligacy. "The '90s were this time where credit was flowing. In Florida you could go through a drive-through and get a mortgage for your dog, for crying out loud. I mean it was just ridiculous." Asked what sets apart the guys who keep their money from those who don't, Corben narrows it down to two factors. "Luck plays a key, obviously, in terms of some of these investments. But really what it is, is the big thing is the ability to say no." Corben first made a name for himself as a documentary filmmaker in 2007, with "Cocaine Cowboys," about another notorious gang of South Floridians, the men whose exploits inspired the film "Scarface." Thanks to his relationship with ESPN Films and their "30 for 30" feature-length documentary series, he feels like he's getting away with something. "This is like the worst kept secret of filmmaking in general, not just documentary filmmaking, making a sports movie is like cheating. Because if you think about it, even like the mediocre sports movies, I'm talking about scripted, as well, but even the mediocre sports movies are still pretty thrilling to watch, you know. When you're flipping through the channels and you see, you know, it's as well made as 'Bull Durham' or kind of cheesy as 'For Love of the Game', to use two Kevin Costner baseball movies. But t's still riveting. It still gives you chills. Even the strongest guy gets tears in his eyes when Costner pitches that no-hitter at the end." Connor Schell, who oversees ESPN Films and serves as producer for their "30 for 30" series, makes it sound like finding talented filmmakers who want to do sports docs is even easier. "Sports is something that collectively people feel so strongly about that there were folks who wanted to dive in and really work with us to tell these stories and reach the right audience," says Schell. "So as we started to go out into the creative community and talk to Barry Levinson and Albert Maysles and Barbara Kopple and Peter Berg and, you know, any number of other great directors that we worked with, you know, they either got it and had a story to tell and said, 'Yes, I want to do this.' Or they didn't. "And that was okay because there were so many interesting voices who really wanted to participate and bought in… We constantly are kind of keeping lists (of topics), reading articles, trying to figure out topics and themes that we haven't covered and want to. But our slate and our sort of guiding principle is filmmaker first… I'm a true believer that the best work comes from folks who are, you know, most interested and passionate about the subject. And once ESPN identified the filmmakers they wanted to work with, they gave them free reign to tell the stories that inspired, says Corben, who confesses to having had some concerns about the corporate overlords. "ESPN Films really stuck to the mandate of allowing the filmmakers to fulfill their vision. And that sounds a little trite but it's really true. Because at any point along the way you could've very easily thought that kind of the strong Disney corporate arm was going to kick in here. But it never did. They were never anything less than completely supportive of what it was that we had planned. And what it was that we wanted to accomplish with the storytelling." While it's clear that ESPN has helped significantly raise the bar for sports docs, Corben believes their influence has been underestimated. "I really think that '30 for 30' really changed a lot. And incredibly while ESPN got a lot of attention and a lot of praise for it in some circles, I don't think I've seen enough written about it, really in almost like the indie film world because what they did for over a year was give us all jobs on that series. Thirty independent documentarians and their companies and their colleagues. And we all worked on really what turned out to be life- and career-altering projects. And I can't say enough about how significant that was. Not just for the sports doc genre but for documentary filmmaking in general. "